There was also a duPont Flint Laboratory for Paint Research that operated there until 1972, when it was moved to Troy. The Troy Lab was closed in 2006. The Lab was then moved to Mt. Clemens. The manufacturing plant continued to operate until Buick City started to be phased out. Not sure what year that closed. I've always assumed that DuPont, as a long-term GM supplier with a local plant, got essentially all of GM's Flint-area paint business, and that it was coincidental that the paint plant was across the street from Buick City. After all, when that paint plant was built, GM still built auto bodies in separate Fisher Body plants, and in some cases delivered them across town in special trucks. Obviously most paint use was at the body plants, not the assembly plants. 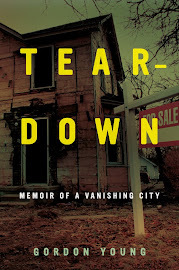 Is that assumption right...did the DuPont Flint plant also supply the Truck Plant (which I think always had a body facility), Fisher Body on South Saginaw, the Grand Blanc Tank Plant during WWII, and all the other GM Flint paint shops...for instance, at the Chevy plant that made straight 6 engines? How about Lansing, Saginaw, Orion Township, etc.? Did Flint supply automotive-production paint to the whole area? I grew up living next door to another regular poster here, whose dad was a chemist...and another chemist lived behind us and one house up on the next street. Kind of an unusual neighborhood, chemist-concentration-wise. That neighborhood was not only one of chemists and other lab workers, in addition to the small businessmen and managers, but a neighborhood of high achieving children. The numbers would defy all probability and statistics. No one believes me when I tell them that this was a neighborhood in Flint. I don't think the toniest areas of Bloomfield Hills, Grosse Pointe, Long Island's North Shore, or Chicago's Gold Coast could compete back then. Stay Pos. Elaborate on this neighborhood more to; sandersmrq@aol.com if this is possible. unclebuck. 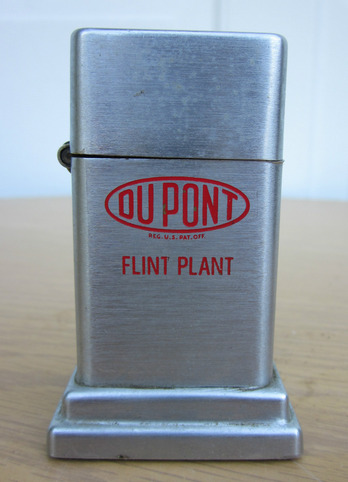 Ironic,a lighter from the Flint plant when employees of the flint plant weren't allowed to carry lighters. DuPont had a wonderful Safety Program that was shared with the families. What they taught them was brought home. One that comes to mind is, "Always keep one hand open for the rail when going up or down stairs."